In efforts to support and promote New Mexico musicians, the New Mexico Music Commission has organized Art2Art. Art2Art creates unique performance opportunities for New Mexico-based musicians while simultaneously supporting and partnering with our valued New Mexico Arts community’s statewide. By working together we create awareness, audiences, and long term artistic, musical, and visual enlightenment. 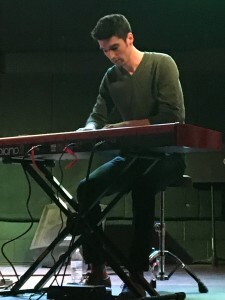 A musical artist and a visual artist perform together on stage or available space demonstrating their forms of creative expression simultaneously. The visual artist paints/draws as inspired by the musician’s (original music) performance. After the performance, the two artists are interviewed by a moderator about their influences, style development and creative processes followed by a Q & A with the audience. Art2Art works well in concert settings, community spaces, entertainment at meetings, conferences, or workshops, and with students in an assembly or classroom. The Commission is interested in bringing ART2ART to all parts of New Mexico and would like to feature local musicians and visual artists as well as our Platinum Music Awards honorees, when appropriate. 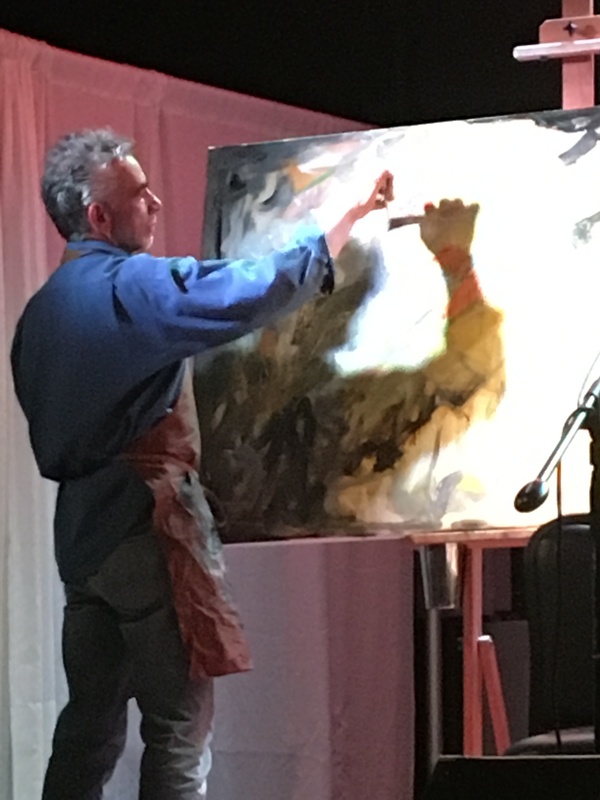 Venue has the option to suggest local musician(s) and/or visual artist(s) or select a pre-packaged Art2Art program titled Melodic Elements featuring Delbert Anderson (trumpet) and Winona House (painter and theremin). See the Melodic Elements promotional video at the bottom of this page. All proceeds benefit future Art2Art programming and the host venue. Proceeds include, but are not limited to: admission, donations, and sale of art donated by featured artist. Email the New Mexico Music Commission to express your interest. We will respond with a general information sheet and begin discussing venue, musician, artist, date, time, proceeds, etc. If you’re interested in booking Melodic Elements, featuring Delbert Anderson and Winona House, please indicate so in your email to us. Thank you! Delbert provided improvisational music on trumpet and Winona created a painting, as inspired by Delbert’s music in two hour-long programs run back-to-back during the Gallup Artscrawl. A theremin was placed directly behind Winona’s canvas which reacted to her brush strokes, creating an atmospheric musical interaction between painter and trumpet. The theremin was preset to a minor Pentatonic scale so that Anderson could improvise harmonically with the tones produced by the theremin. Music Commission Acting Chair Melissa Sanchez emceed the event, led an interview with the artists, and facilitated Q&A with the audience following the performance. The event was sponsored by New Mexico Arts, GallupARTS, and the New Mexico Music Commission Foundation. Winona’s paintings are for sale at the ART123 Gallery in Gallup with proceeds benefiting art education programming at GallupArts and future Art2Art programming.